Stunning modern 4 bedroom Ovacik villa for sale with a large swimming pool and secluded gardens. 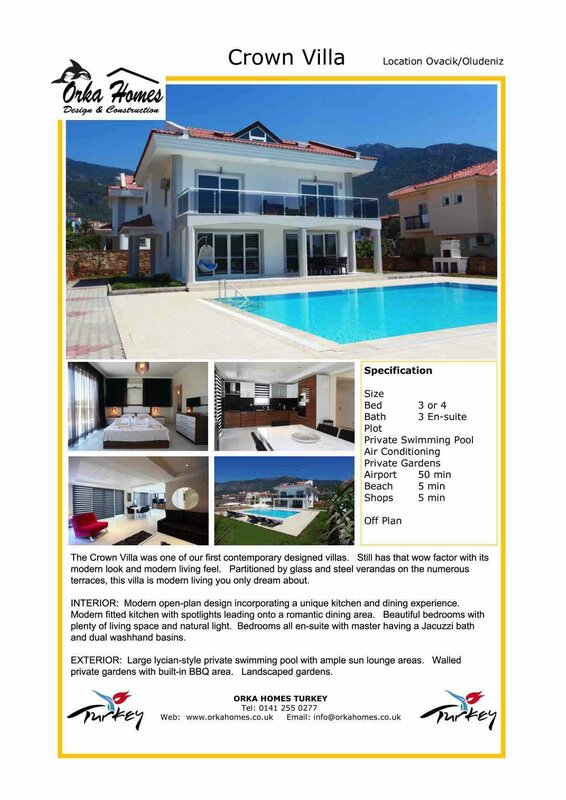 The Crown villa is a uniquely designed 3 or 4 bedroomed detached villa with its own swimming pool. It is located in the Valley of Ovacık set in its own walled garden with panoramic views over the Ovacık valley and the Babadag mountain. Each bedroom has its own balcony with stunning views. A peaceful relaxing location yet still within easy reach of all the local amenities. The large internal space is of an open plan design on the ground floor with a large lounge, kitchen and dining area. There is a separate W/C and plenty of storage space. Double patio windows lead you out into the gardens where you will find the swimming pool and sunbathing areas. Upstairs you will find four double bedrooms with en-suite facilities and balconies overlooking the swimming pool and countryside.